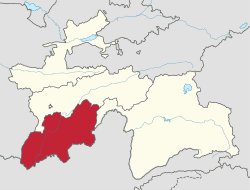 Khatlon Region (Tajik: Вилояти Хатлон), one of the three provinces of Tajikistan (Tajik: вилоят, viloyat) is the most populous of the four first level administrative regions. It is situated in the southwest of the country, between the Hisor (Gissar) Range in the north and the Panj River in the south and borders on Afghanistan in the southeast and on Uzbekistan in the west. During Soviet times Khatlon was divided into Kurgan-Tyube (Qurghonteppa) Oblast (Western Khatlon) – with the Kofarnihon and Vakhsh river valleys – and Kulob Oblast (Eastern Khatlon) – with the Kyzylsu and Yakhsu river valleys. Both regions were merged in November 1992 into today's Khatlon Province (or viloyat). The capital is the city of Qurghonteppa, formerly known as Kurgan-Tyube. Khatlon has an area of 24,800 square kilometres and consists of 24 districts – 14 in Western Khatlon and 10 in Eastern Khatlon. The total population of Khatlon in 2008 was 2,579,300, up from 2,149,500 in the 2000 population census. The population in Khatlon is mainly engaged in Agriculture. During the Soviet era, Khatlon became one of the two main cotton regions in Tajikistan. The other one is in Sughd (Leninabad). Collectivisation of agriculture was implemented aggressively in the early 1930s, to expand the extent of cotton cultivation in Tajikistan as a whole, with particular emphasis on the southern part of the republic. The process included violations against peasants, substantial expansion of the irrigation network, and forcible resettlement of mountain peoples and people from Uzbekistan to the lowlands. The results of this policy are to be seen in the ethnic composition of Salua oblast as well as in the fact that the Tajik population identifies themselves either as Gharmis (resettled from the mountains) or Kulobis. These groups never melted, and fought against each other during the Civil War in Tajikistan. Khatlon oblast suffered the heaviest damage in Tajikistan. Since the conflicts leading to the civil war were never really resolved, tensions in the region still exist. The eastern part – Kulob – is home to the president and his clan and has thus gained a lot of political influence. During Soviet times, the region cooperated with the then ruling elite from Leninabad, and was responsible for the militia, the army and the security forces. 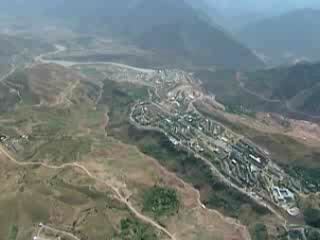 Kulob is regarded as a very conservative region. In the capital Qurghonteppa and parts of Kulob, the Islamic opposition has a lot of support among the Garmis. The Kulyab clan is based in Khatlon. In February 1996 Colonel Mahmud Khudoiberdiyev launched a rebellion, insisting that three officials from the Kulyab clan resign before he ended the rebellion. The government complied. Additionally, Prime Minister Dzhamshed Karimov and Abudzhalil Khamidov, the Chairman of the Leninabad Oblast executive committee, resigned. The ethnic composition of Kulob region is: 85% Tajiks, 13% Uzbeks, 2% others. In Qurghonteppa the breakdown is 59% Tajiks, 32% Uzbeks and three percent Russian.